THE international secret Jews community is explained objectively in this book by the outstanding Jewish leader and rabbi, Dr. Joachim Prinz who also wrote Dilemma of the Modern Jew and Popes from the Ghetto: A View of Medieval Christendom. The community originally named as Marranos began in Spain since the fourth century. Then, after the Spanish Inquisition they spread around the world with the various name and different faith especially Christian and Islam. They are Judaizers; Christians or Muslims but practicing Judaism in secret (40). Jadidim or originated Djedid al Islam is a Muslim Jewish community in Persia. "On the surface, they are practicing Mohammedans. They participate fully in the great pilgrimages to the holy places in the city" (6). Jadidim pray five times a day although the Jews pray only three times a day. They also fast during Ramadan. They bury their dead in the Muslim cemetery but wash the body in accordance with Jewish customs (6-7). Another Muslim Jews are daggatus, the Jewish Bedouin of the Sahara. However, they know nothing of the Talmud and have very little knowledge about Jewish faith and customs (7-8). While doenmehs (the renegades) or ma'aminim (the true believers) are the Muslim Jews in Asia Minor. It began in 1686, when more than three hundred families converted to Islam in Salonika. In 1913, the doenmehs moved to Constantinople (118). Prinz concluded that the doenmeh or the Mohammedan Marrano is the product of the conversion of Shabtai Zvi in the seventeenth century (191). "Among the leaders of the revolution which resulted in a more modern government in Turkey were Djavid Bey and Mustafa Kemal. Both were ardent doenmehs. David Bey became minister of finance; Mustafa Kemal became the leader of the new regime and he adopted the name of Atatürk. His opponents tried to use his doenmeh background to unseat him, but without success. Too many of the Young Turks in the newly formed revolutionary Cabinet prayed to Allah, but had as their real prophet Shabtai Zvi, the Messiah of Smyrna" (122). "In Spain's attempt to make the entire country Christian, synagogues as well as mosques were often burned" (21). In Spain in 1256, an anti-Jewish policy was embodied in the Seven Part Code of Alfonso the Wise (21). In 1348, this code became the law of the land (22). Thousands of Jews were killed in Spain through the pogrom (26) in the name of the Spain's own crusade (25), and ended the "Golden Era" of Spanish Jews during "the hundreds of years of tolerant Arab rule" (26). Later, within less than ten years, more than two hundred thousand Spanish Jews became Christians. In Valencia, for instance, all the survivors of the massacre converted (30). These Christian Marranos or chuetas intensively appeared in Spain and Portugal of the fourteenth and fifteenth centuries (191). In the nineteenth century, there were about one hundred and twenty thousand Jews converted in Western Europe (32). However, the conversos during this time were not forced because of massacres or pogroms (32). Prinz quoted Heinrich Heine, the German poet who considered his baptism as only as "the admission ticket to Western civilization" (32). Prinz also has presented how the great majority of the conversos did not become faithful Christians. The book which consists of seven chapters is begin with the saying of Solomon Ibn Verga (Jewish writer in 15th century): "It is no use to Your Majesty to pour Holy water on the Jews and call them Peter or Paul, while they adhere to their religion like Akiba or Tarphon. There is no advantage in their baptism except to make them overweening against true Christians and without fear, since outwardly they are accepted as Christians..." (Also in page 41). 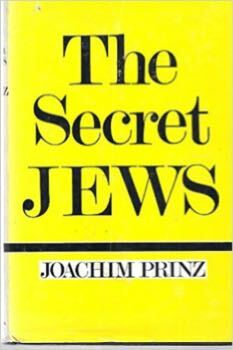 As a great Rabbi, Dr. Joachim Prinz has evaluated various groups of secret Jews around the world in the perception of Jewish's thought and has discussed how they have transmitted the customs and traditions throughout the generations. However, the evaluation was not as refined as in The Marranos of Spain: From the Late 14th to the Early 16th Century, According to Contemporary Hebrew Sources authored by B. Netanyahu. At one point of view, this community is very unique and extraordinary, they could have survived at every land they occupied successfully possessing higher status than the origin people. It is worth for me to get this valuable reference all the way from US by using Amazon.com services.